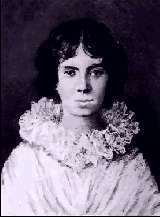 Emily Dickinson was a prolific and significant American poet whose reluctance to publish and reclusive lifestyle in later years has earned her the nickname the "New England Mystic." She was born the second child of three in a religious family with deep New England roots. Her father, Edward Dickinson, was a lawyer who served as treasurer of Amherst College (founded by his father) from 1835-72. He additionally served a term in congress from 1853-55. Her youngest sister, Lavinia, never married and stayed in the family home. Her older brother married one of Emily's friends and moved in next door. Dickinson herself was educated at Amherst Academy and then Mount Holyoke Female Seminary, and became quite reclusive in later years. Dickinson is best known for experimentation in rhythm and rhymes. She began to write in 1850 and wrote only a handful of poems before 1858. Her early poems are considered quite conventional and she was heavily influenced by Ralph Waldo Emerson and Emily Brontë. However, after this initial period, she began to experiment with form, style, and language. Her predominant poetic form was the iambic quatrain and a great deal of the meters match those of hymn writer Isaac Watts, William Shakespeare, or the King James version of the Bible. However Dickinson stripped her poems of superfluous words and, as a result, most of her poetry is terse. She frequently played with syntax and words to shock the reader. Themes of her poems often include love, death and nature. Dickinson did receive encouragement for her literary efforts, for example from her friend Thomas Higginson. And unlike Higginson, who advised her not to publish her unconventional verse, some, like Dickinson's friend novelist Helen Jackson, urged her to publish a collection of her poetry. Such entreaties were in vain, however, and in fact only seven of her poems were even individually published during her lifetime. Other friends included Reverend Charles Wadsworth, whom Dickinson met on a trip to Washington to visit her father. During the Civil War Dickinson wrote approximately 800 pieces. While not specifically about the war, these poems reflect an uneasy sense of tension and internal conflict. During this time she felt isolated and separated from her friends: Wadsworth was in San Francisco and Thomas Wentworth Higgson was an officer in the war. In addition she encountered eye problems during this period. Tension in her writing has also been attributed to her religious skepticism. Her literary work slowed considerably after 1870, at which time she began to lose several of her closest friends and family members to death, including her father, mother, nephew, Wadsworth, and Holland. She became a recluse later in life, wearing only white and well guarded by her sister. After her death in 1886 her works were published by her sister, edited by Higginson and Dickinson's niece Mabel Loomis Todd.